“I worked in midtown Manhattan for a couple of years and I lived in LA for 18 years. To me Lima is kind of the best of both. In the sense that you have a lot more cultural stuff than you do in Los Angeles, but the pace is slower than New York City,” says Maureen Santucci, who has lived in Peru for almost a decade. Peru’s “City of Kings” sprawls across the desert landscape almost midway along the 2000-mile Peruvian Pacific Coast that stretches from Ecuador in the north to Chile in the south. It is the country’s business, culinary, and retail hub and is also home to the largest concentration of expats. With a population of over 10 million people, almost one-third of Peru’s total, it is not surprising that you can sometimes be overwhelmed with traffic, noise, and pedestrians. People tend to love it or hate it. Like most major cities, Lima’s seaside location is the reason for its growth and importance. Nearby Callao acts as the metropolitan area’s major port and one of Latin America’s largest. And as with most of Peru’s other coastal cities, its life began along the shores of at least one waterway, in this case the valleys of the Chillón, Rímac, and Lurín rivers. From the beaches of Miraflores and Barranco, two of the more touristy districts, the city stretches back into valleys and mountain slopes located as high as 5000 feet above sea level. Within the city are isolated hills such as El Agustino, San Cosme, El Pino, and La Milla. Great views of the city and the Pacific Ocean can be had from the lookout at the top of the 1,300-foot San Cristobal hill that lies directly north of the downtown area. The current metropolis has grown up around a history that dates back to pre-Inca times with much of its past still visible in its numerous archaeological sites and extensive museums. The Spanish town of Miraflores was not established until the 16th century and merged into the Lima Metropolitan Area during the early 20th century. But the spectacular Huaca Pucllana, a great pre-Inca adobe and clay pyramid ruin, dates back before the 5th century A.D. Here you can tour the huge seven-story structure and try to envision what this bustling area was like all those centuries ago. Much more of this ancient civilization still remains buried under the city and has yet to be discovered. Located in the metropolitan area, the busy Jorge Chávez International Airport provides regularly scheduled domestic and international flights. 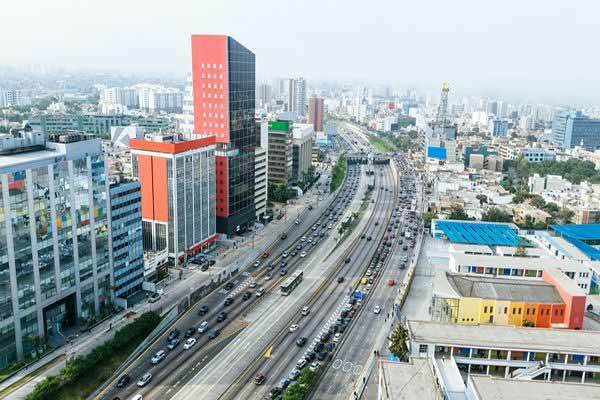 And with its large port, international airport and all major roads leading to the rest of Peru, Lima is the most popular location to start any type of business enterprise. Lima has always played second fiddle to the more popular areas of the country when it comes to travelers. It’s a jumping-off point to famous locations such as Cusco, Machu Picchu, Arequipa, Nazca, and the northern beaches but the city itself has much to offer. 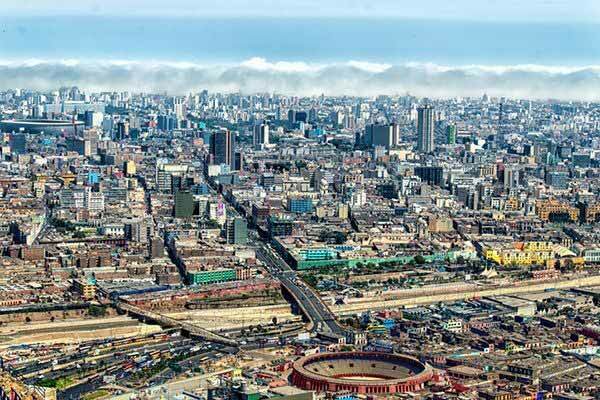 Lima is made up of 30 districts, each with their own personality. For first-time visitors, Miraflores makes for a good base to explore the other regions of the city. With over 100,000 residents, it is home to many art galleries, fine restaurants, and glitzy shops. Bustling Avenida Jose Larco stretches south from centrally located Kennedy Park to the modern Larcomar Mall and is lined with a large array of restaurants, bars, and department stores. The Larcomar Mall offers a good variety of Peruvian and international retail shops and restaurants. Built into the side of towering cliffs that define the border of Miraflores with the Pacific, this modern shopping center provides spectacular views of the coastline in either direction and plenty of photo ops. It is a great spot to observe surfers riding the waves below and parasailers flying overhead on the powerful updrafts provided by the seaside cliffs. In this thriving metropolis, small local restaurants exist hand-in-hand with a large selection of more upscale dining establishments, including Central Restaurant that continues to win accolades as one of the best in the world. But locals still love Peru’s favorite barbequed street food—anticuchos. These tender marinated cow hearts on a stick are sold everywhere in the country and Lima is no exception. Local street vendors peddle traditional sombreros with a backdrop of modern retail shops selling the latest in computer accessories and high fashion. Towering upscale hotels such as the Hilton, JW Marriott, and the Belmond cast their dark shadows on much smaller hostels, private B&Bs, and older residences. A couple can live in Miraflores for $2,500 a month, or less. Although one-bedroom apartments can be found for $500 per month, you will be looking at at least $1,000 per month for a larger unit in this part of town. But you will pay a premium price to purchase or rent one of the spacious modern waterfront condos overlooking the beaches below. One large park leads into the next along the waterfront but the crowning glory is Love Park, located on the cliffs of Chorrillos overlooking the sea. The poet Antonio Cilloniz lamented that “In the cities, they do not build monuments to lovers”, but Miraflores was the exception and opened Parque del Amore in 1993. The unique park is surrounded by walls of romantic quotes scripted in mosaic tiles and features a prominent statue of two lovers in a passionate embrace in its center. The Malecon, a scenic cliff top walkway, stretches for almost six miles all the way to Baranco. With its large number of popular bars, excellent restaurants and flashy nightclubs, Baranco is the “go to” location in Lima for nightlife and a mecca for art lovers. Throughout Baranco, colorful murals adorn many walls and buildings, art galleries and museums abound, and colonial buildings provide numerous photo ops. The Contemporary Art Museum—MAC, founded in 2013, is the only museum in Lima that specializes in modern and contemporary art. The Historical Museum, Pedro de Osma, holds the colonial art collection belonging to Don Pedro de Osma Gildemeister. At the bottom of the 250-foot cliffs, the busy Circuito de Playas, known as the Costa Verde, winds its way along a series of rocky beaches interspersed with restaurants, clubs, and hotels. This seaside highway is a major route that joins several of Lima’s coastal districts. As popular as Miraflores and Baranco are, many residents opt for less expensive and less touristy districts. Only a short drive from Miraflores, San Miguel offers a more peaceful existence away from the tourist crowds and commercial hustle and bustle of Miraflores. Adjacent Pueblo Libre is home to the largest number of parks of any district in the city. It is also where you will find the Larco Museum, one of Lima’s most visited sites. Dating back to 1926, the Larco Museum offers a varied collection of 3,000 years of ceramic, textile and precious gold and silver artifacts. Lima isn’t always the city that travelers adore at first sight. Some of that has to do with the weather. La panza de burro (the donkey’s belly) is the local term for the permanent blanket of grey fog and cloud that can shroud the city for much of the winter (June to October). On the rare days that the sun breaks through, it is a cause for celebration. But winter temperatures rarely fall below the mid-50s F and the summer months bring sunny skies and warm temperatures with an average of 77 F.
Compared to other parts of the country, Lima can be one of the most expensive places to live in the country. However, there are couples that enjoy a relatively low cost of living in less touristy neighborhoods. 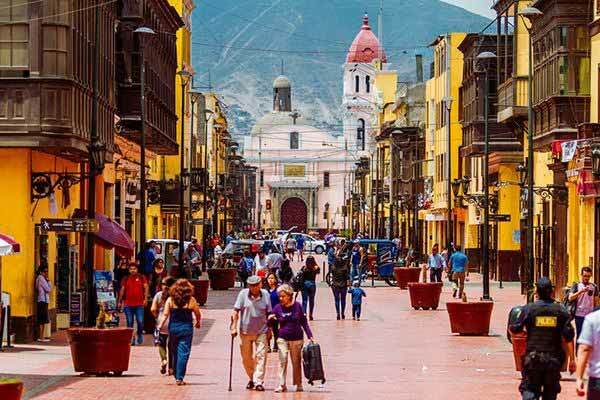 Expats report paying less than $500 per month for a three-bedroom, two-bathroom condo in San Miguel and having total monthly expenses around $1,200, but most say that a couple would need at least $2,500 a month to have a comfortable lifestyle in Lima. You will find all the modern amenities in Lima, including many international retail chain stores and restaurants. Along with well-stocked grocery stores featuring many imported items (at more expensive prices), there are a host of large fresh fruit and vegetable markets where a week’s supply of produce can be purchased for a fraction of what you would pay in the U.S. or Canada. Keeping busy in Lima is not difficult. The city has a vibrant theater scene, a good assortment of art galleries and museums and a close-knit expat population that feeds a large number of expat organizations and activities. The following table provides a sample monthly budget for a couple in Lima in the more popular districts. Quality healthcare is available in Lima’s private clinics and hospitals with well-qualified doctors and up-to-date advanced technologies and treatments. Most of the handful of Peru’s JCI accredited institutions are found in the city, including the bilingually staffed Clinica Anglo Americana which has been around since 1921. Charges tend to vary greatly but the cost will always be much less than that found in the U.S. Consultation fees are generally less than $20. At least two dozen private companies offer healthcare insurance packages but usually the cutoff age for applying is 65. Hospital networks such as San Pablo also have a large variety of packages available that cover inpatient and outpatient costs. There is usually a small co-pay fee but the monthly costs are very affordable. Plans start at less than $70 but become pricier as you approach 65 and beyond. Hiring full-time domestic help is also very affordable with monthly costs starting at less than $500. Wages will depend on whether they live in your house or not. Hiring a cleaner for one or two days a week is going to be quite inexpensive.